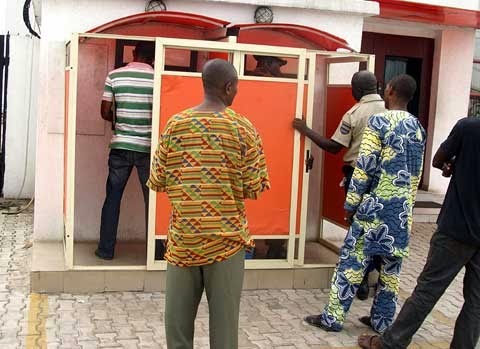 An Automated Teller Machine, ATM, card fraudster, whose name was given as Joshua Adejumo, has been arrested in Oyo state with different 14 cards in his possession belonging to various banks. The 38-year-old was nabbed by operatives of the police command in the state after a complaint was lodged against him by a victim at the Iyaganku Police Station. The State Commissioner of Police, CP, Mr. Leye Oyebade, while parading the suspect at the Police headquarters at Eleyele, Ibadan on Thursday, said “Joshua, in his usual manner, approached one Abosede Ganiyu, a sales girl, who had gone to withdraw money from the ATM of a commercial bank at Dugbe and offered to render assistance to the victim. The suspect, Joshua, who claimed to be a commercial driver said: “Someone did it to me. That was why I started doing it. Whenever I see anyone come to the ATM and cannot operate the machine, I offer assistance to them. “I will then say their ATM card is stuck in the machine. “The unsuspecting customer proceeds into the banking hall to complain and I would, thereafter, withdraw money from the customer’s account. “I do not get a lot of money from this act. The money I get I use to maintain myself,” the suspected fraudster confessed. The CP noted that the suspect will be charged to court soon. Chika Ike Stuns In Black Dress …….. Previous articleIs Carolina Wassmuth Dating May D? Liverpool’s Enrique Likely to Face Surgery and Miss the Rest of the Season.